ITC intumescent paint provides durable wear, weather and wash resistant fire protection paint for decorative interior and exterior timber surfaces. Use with SFR dualcoat. Meets new Fire Regulations standard BS EN Class B s1 dO and complies with Class O.
SFR dualcoat releases a vapour to suppress toxic gasses & prevent flame spread. 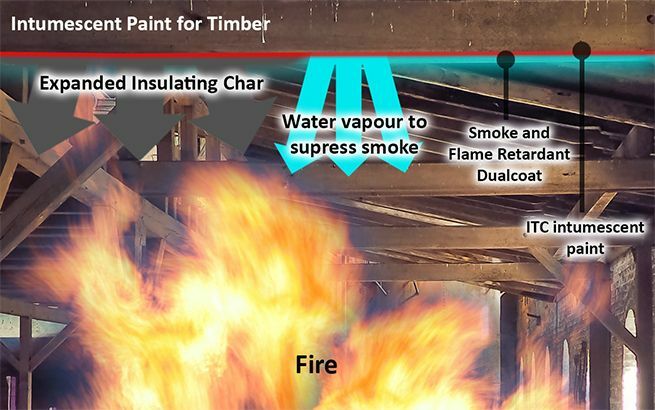 ITC intumescent paint expands to create a barrier, insulating wood from heat and oxygen to prevent wood burning & fire penetration. Class 1,0 +B s1 d0 – 1 coat ITC intumescent paint (20 & 80 sq m packs) with 1 or 2 coat SFR dualcoat. 30 & 60 minutes – 3 coats ITC intumescent paint (5 kg packs) with 1 coat SFR Dualcoat. SFR dualcoat releases a vapour to suppress toxic gasses and prevent flame spread. When used with ITC intumescent paint, the SFR dualcoat provides a durable hard wearing, weather and wash resistant fire protection system. For decorative interior and exterior timber surfaces. SFR dualcoat meets new Fire Regulations standard BS EN Class B s1 dO and complies with Class O. 1 coat SFR Dualcoat over Timbercoat. 2 coats SFR Dualcoat external over Timbercoat. Durable, Hard but flexible decorative paint. White + BS & RAL colours. 20 and 80 square metre packs and 5kg Packs.